"An Old Classic with a Colorful New Look." You Display a Black Tray with Three Colorful Shot Glasses and a Silk with a Knot tied into it's center. The Naughty Silk, is then pushed into one of the shot glasses. Now you lead your Audience down the path to the Magic Flying. As you ask the Audience to watch. 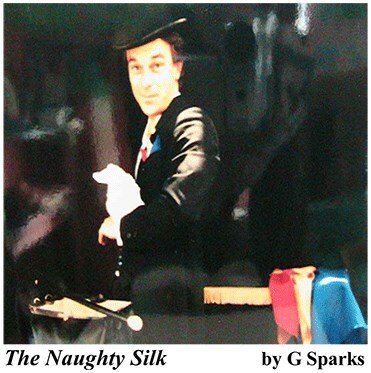 The Naughty Silk, Fly from Side to Side, Glass to Glass and back again, the Audience is not to impressed seeing you move the silk and tray around by hand. Until that Magical Moment when, the Naughty Silk, is seen Flying through the Air from one Glass to Glass on it's own. Comes ready for the Magic Flying to begin, just set up the glasses on the tray and start the show. Fun and easy to do.